2.25L HarvestLine system liners fit JS-5.0 rotor with J-wide cups (part number 367820). 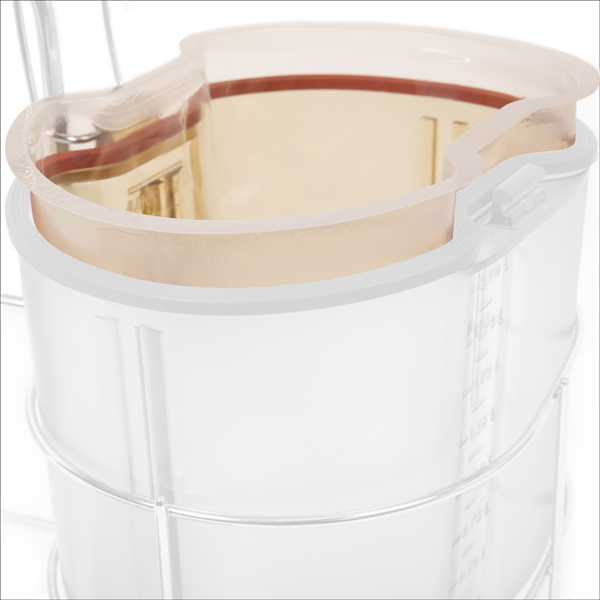 The built-in spout on the cup cover allows loading of samples by pouring though tubing or a pipette. It also allows for easy decanting. A removable plug covers the spout during centrifugation. The replaceable air-vent filter allows passage of air, while preventing the passage of liquids and aerosols. Rotor Compatibility Compatible with the JS-5.0 high-performance rotor. Use as liner for JS-5.0 J-Wide Cups. Features This product package kit includes 60 air vent filters, 50 HarvestLine System Liners, 4 red cup gaskets, 4 green gaskets for liners, 2 cup racks, 1 spatula, and 4 JS-5.0 container assemblies.